invaluable knowledge that he has applied to saddle fitting, making him one of the best saddle fitters in the country. 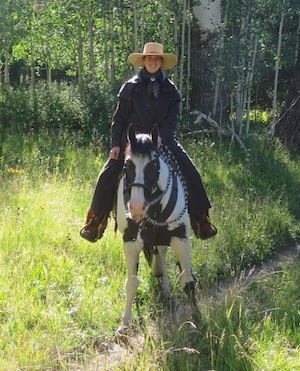 Bob cowboyed in NV and outfitted in AZ & CO. Bob’s passions are teaching and providing whole horse evaluations, most outdoor activities including horseback riding, hunting, fishing & camping. Cracker’s passions are eating, learning, being groomed, standing in the winter sun, and receiving nose kisses! Terri is the business manager, which includes being the product buyer, web master, custom order designer, head of customer relations and accounting. 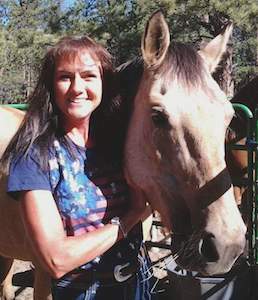 Terri’s passions are teaching and providing whole horse evaluations, equine energetic evaluations using Kinesiology to set up custom herb programs for horses, most outdoor activities including muleback riding, fishing & camping. "Dita" is the shop greeter, herder of humans, equines, her cat and our visitor alarm. 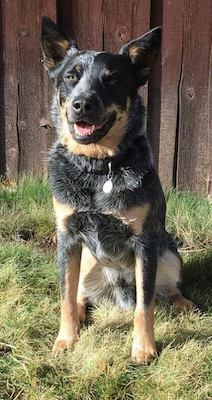 Her passions are going for walks, herding, cat wrestling, playing ball, chasing a laser light and chewing on chewies, antlers, and various other things that sometimes get her in trouble. Izzie's job description includes providing her human and dog family with various critters at inopportune moments during the night and day. 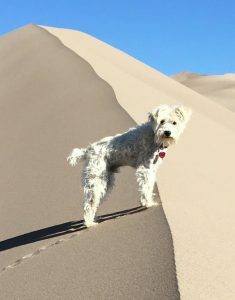 Her passions are hunting, eating, sleeping, cuddling with her humans, going for walks with her family and dog wrestling. Brodie is our lover boy! He loves going for runs, chasing balls, playing with the other dogs, cuddling, chewing on antler pieces, meeting new people and hanging out with his people. Estella enjoys every minute she invests learning from Bob, and making the custom and stock orders in the shop. She went to university in England for Fine Art and Graphic Design and made Terri's vision of a new, updated OWS website a reality. She also helps with our social media, and loves connecting with our customers. Estella's passions aside from leather work include horsemanship, playing the harp, painting, photography, cooking, traveling, and learning new things. 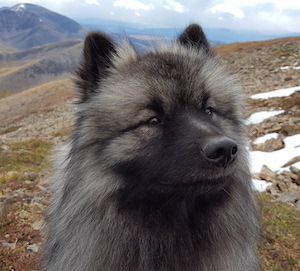 Bravo’s passions are eating, exploring new trails, belly rubs, playing with Estella and other horses, putting his feet on things, trying his heart out, and generally being entertaining. I said I wanted a lap dog that could keep up with my horse when I ride, and when my fiancé and I saw his photo, with his long legs, and sweet eyes, online at the New Mexico shelter, we bought him without even meeting him in person! He was only a year old then, and is everything we could have wanted in a little companion: Calm, playful, quiet, loving, and up for anything! If you visit the shop, you are sure to meet him as soon as you walk in the door, as he hangs out with me all day, every day! Emily is the main person that answers the phone with pure fun & enjoyment helping our amazing customers. She answers many of the emails, pulls orders, invoices and packages them and gets on the road. Emily's passions are most out door activities including horseback riding, hiking, exploring, camping and snowmobiling. Cody's passions are being brushed and rubbed, a bath on a hot summer day after being ridden and exploring with Emily. He is literally my little "bundle of joy". I waited almost six months for him and he was everything that I could have expected. Kota is so willing to please and loves to play. Kota is a lover!